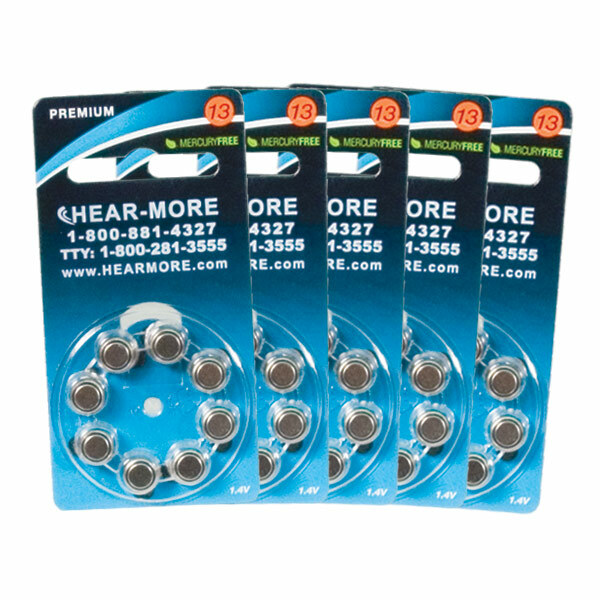 HearMore Hearing Aid Batteries are safe and environmentally friendly HearMore Premium Mercury-Free Hearing Aid Batteries feature the newest generation Zinc Air design, providing consistent voltage supply and reliable performance for your assistive hearing devices. These 'green' hearing aid batteries are compliant with mercury-free legislation enacted in many states in the United States. As mercury batteries used in hearing aids decay in landfills, the mercury has the potential of leaching into our lakes and streams, eventually ending up in drinking water or contaminating wildlife such as fish. HearMore Mercury-Free Hearing Aid Batteries come mounted on a compact 1.75 inch x 3.5 inch card/dispenser that slips easily into a purse, pocket or wallet. A blister pack cover keeps batteries protected until you are ready to use them. 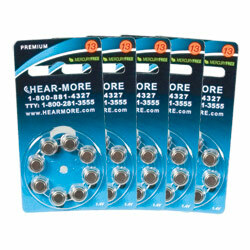 When you need a hearing aid battery, simply remove a single battery through the perforated strip on the back. Use these hearing aid batteries for popular brands of hearing aids, including Starkey, Beltone, Miracle Ear, Siemens and others. Carton of 40 Batteries (5 8-pks).